This entry was posted on Thursday, August 30th, 2012 at 1:35 am by murtwitnessonelive and is filed under Uncategorized. You can follow any responses to this entry through the RSS 2.0 feed. You can leave a response, or trackback from your own site. I think it all smoke and mirrors. I bought the book and it is very enlightening. I think the “whiny boycotters” are just jealous. The book should have done far better than it has. One cannot say if the boycott movement had any effect or not. 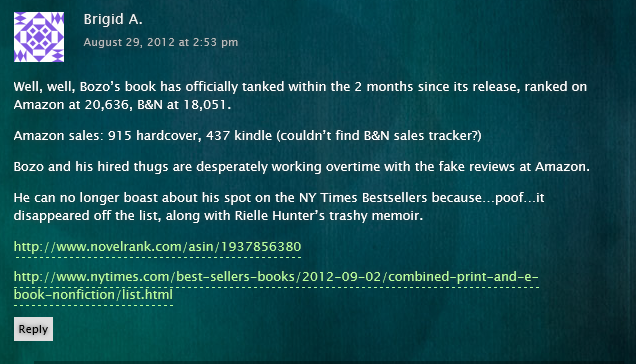 I do understand it was a well written book since it was a professional writer who wrote it based on Baez’s statements. True Murt and it does point out a awful lot of valid points. What surprises me is that the book did so poorly. It is hard to even try and get numbers this low. Well, FLO, First things first. I NEVER ADVOCATED THE MURDER OF A CHILD, YOU DID. YOU ADVOCATED THE MURDER OF FOUR CHILDREN. Second I NEVER PRETENDED I KNEW THE WHEREABOUTS OF TRENTON DUCKETT. That is YOUR LIE number one. Third. I apologized for the caretaker letter and OWNED UP TO IT. LK forgave me as representative of the Duckett family and the matter is consider CLOSED. FINALLY I always have and still have good relations with my family which you INSIST on bringing up. Which brings up an interesting question: HOW WOULD YOU KNOW WHAT MY FAMILY THINKS ABOUT ME ANYWAY? WHY DO YOU ADVOCATE THE MURDER MIXED RACE CHILDREN?